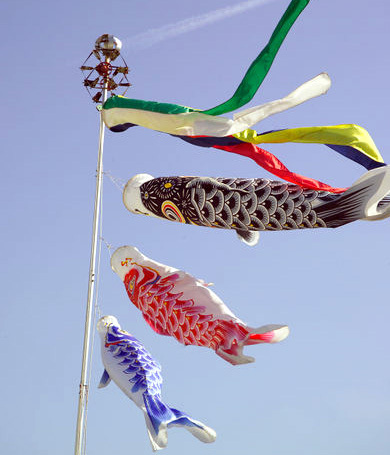 Brightly dyed carp streamers will soon be fluttering above houses in Japan and many Japanese American homes. Kodomo No Hi, otherwise known as Children’s Day, is a nationally observed holiday in Japan, traditionally celebrated on May 5. JAMsj will be celebrating Kodomo No Hi on Sunday, May 1, with kabuto (samurai helmets), koinobori (carp streamers), and origami making in the museum parking lot for the annual Nikkei Matsuri Festival. May 5 was previously recognized as Boys’ Day in honor of male children but was changed to Children’s Day after World War II. However, the celebration of Children’s Day still maintains some of the traditions of Boys’ Day. On this day, many families honor youthfulness. Children in Japan frequently do arts and craft projects in school, creating kabuto and koinobori, representing strength and determination. Children also eat rice cakes wrapped in oak leaves, symbolizing strength. Koinobori are cloth fish wind streamers that are flown outside of the home, wishing good luck to the family’s children. Carp are revered for their energy and resilience for swimming upstream and overcoming obstacles. Often times, there will be a “family” of fish hung together. The wind blowing through the streamers makes the fish look as if they were swimming. The largest koinobori is black, representing the father. The pink or red fish represents the mother. Green or blue koinobori represent the boys in the family. Koinobori making in school for a child in Japan is as common as American children decorating a tree during Christmas. For information about the Children’s Day Celebration at JAMsj, click here. For information about the San Jose Nikkei Matsuri Festival, click here. This entry was posted in Events and tagged "Japanese American Museum of San Jose" "Children's Day". Bookmark the permalink.